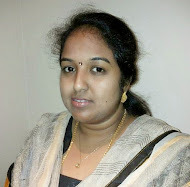 "The Food Samaritan" and the ingredient given by her is Paneer and Flour. 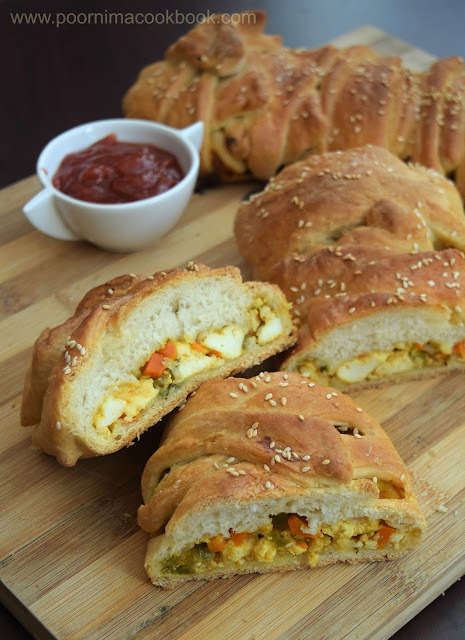 I have used both the ingredients and prepared a delicious Paneer stuffed braided bread. Though I am not an expert in baking breads, I always enjoy the opportunity to try my hands on baking. Preparing bread at home was quite interesting and my kids liked it very much, especially with their favourite paneer (Indian cottage) stuffing! Heat oil, in a pan, add cumin seeds. Once it crackles add onion. Sauté till the colour changes and then add ginger garlic paste, tomato, all the spice powders and salt. Once the tomatoes becomes soft add capsicum and carrot. Saute well. Add crumbled paneer into the tomato mixture and mix well. Cook on a medium flame for 1 to 2 minutes. Add last, add garam masala and coriander leaves. Mix well. Take a wide bowl, add flour, salt, sugar and yeast. Mix it and make a well in the center and add milk and oil. Slowly mix water to form soft dough. Turn out dough onto lightly floured surface; knead until smooth and elastic for about 10 minutes, adding enough of the remaining flour as necessary to prevent sticking. Once it is raised, punch the dough and divide the dough into two portions. Flatten one roll into oval shape using rolling pin. Place the paneer filling in the center and make equal slits on both sides and create a pattern by using using the slits on both sides to cover the filling completely. Grease baking tray or lined with parchment paper and carefully transfer the braided bread into the baking tray. Cover it with towel and let it rise until puffed, for about an hour. Beat the egg white and brush a generous quantity over each braid. Sprinkle with sesame or poppy seeds as desired. Be sure to apply in the cracks and down the sides of the loaf. Bake at 180 degrees C for about 30-35 minutes, until it is browned evenly. Using a serrated knife, cut into slices. Serve it along with tomato sauce and Enjoy! 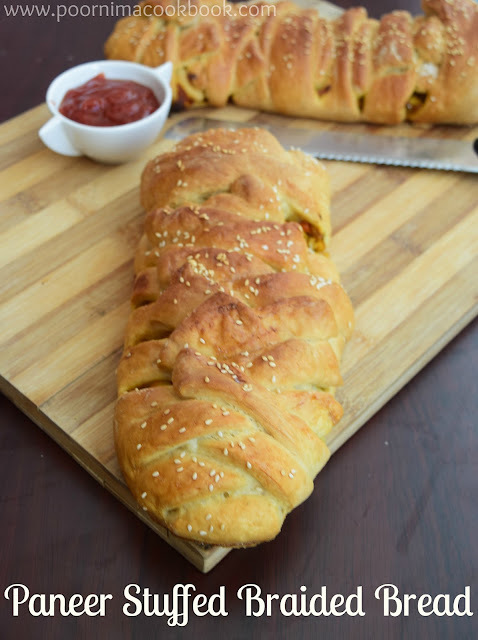 a nicely braided bread and just love the stuffing. 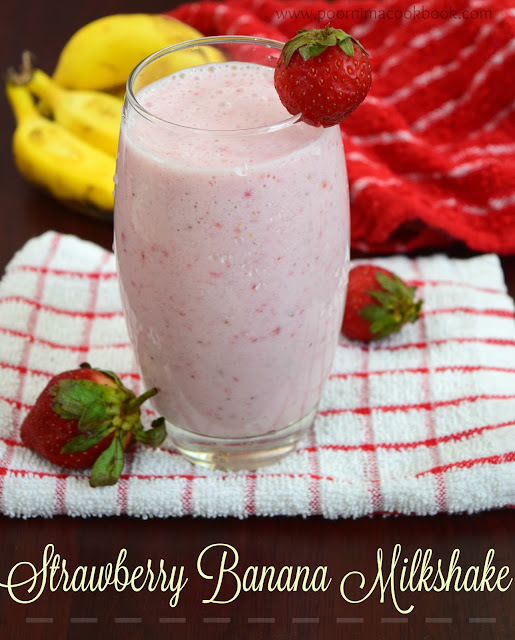 Awesome recipe with the ingredients given to you Poornima. 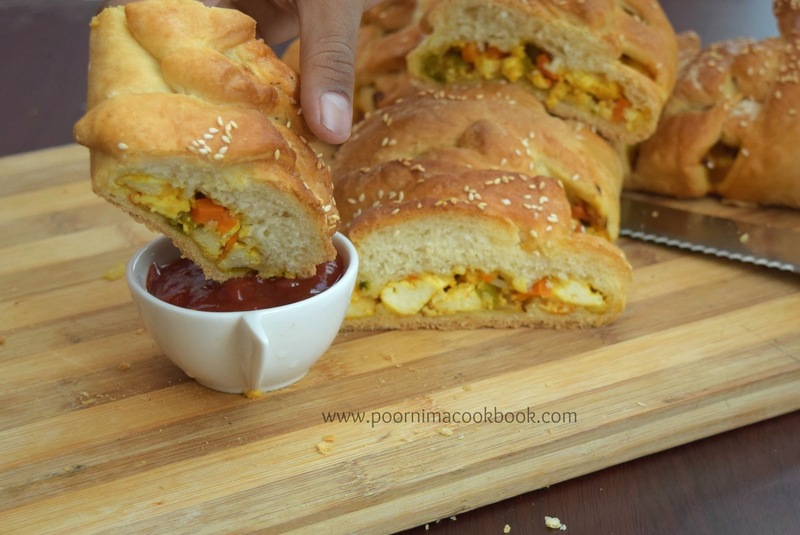 Yummy bread Poornima..this is on my agenda now! Looks fabulous and tempting ! 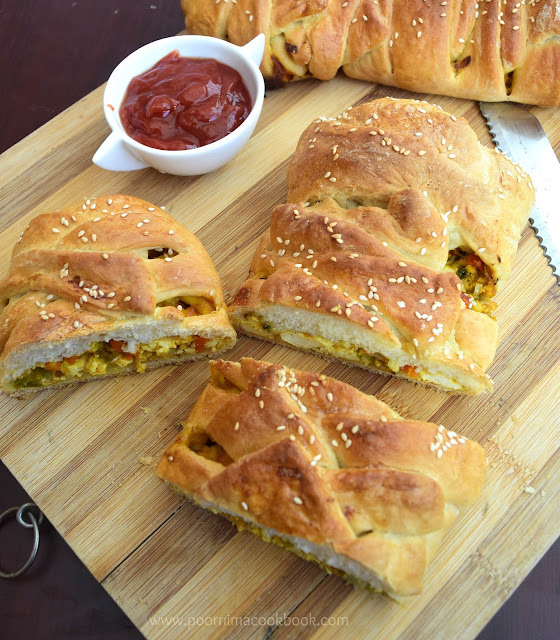 This is a lovely stuffed bread.. The filling looks so tasty. Couple of slices will make a nice and light brunch. Wow...Such a wonderful braided bread.